The Biogas sector in Spain is moving forward and in Europe is consolidating, the potential of this Renewable Resource is very high. INDEREN a company for general installations with extensive knowledge in Electrical Installations, Pumping Systems, Distribution Networks and Gas Installations, in collaboration with other companies operating Biogas of national and European scope; offers its services for the realization, execution and maintenance of biogas plant facilities. Biogas is, as its name implies, a combustible gas that is generated by biodegradation reactions of organic matter. Biogas has thermal and electrical uses from the treatment of waste water, urban solid waste, industrial waste, livestock, agricultural and agro-food industry. We can say that any type of waste of organic matter is susceptible of being transformed into energy, through its previous transformation into biogas. In the Biogas sector, what do we do? 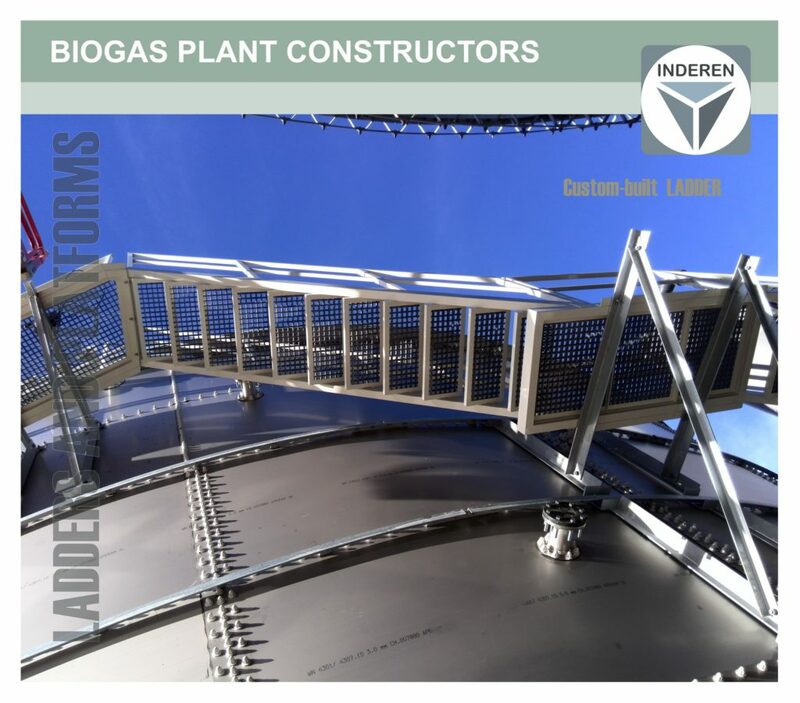 Inderen carry out works in industrial installations for electricity generation with biogas. The company has extensive experience and expertise in the development and execution of installations in industrial plants. We have our own offices and workshops located in Albal-Alcasser (VALENCIA), this allows us to have a correct time management for the design, manufacture and installation of piping, collectors, skids, platforms, metal structures, stairs, etc. We carry out all types of design and manufacture, CUSTOMISE according to the needs of the ground and elements. 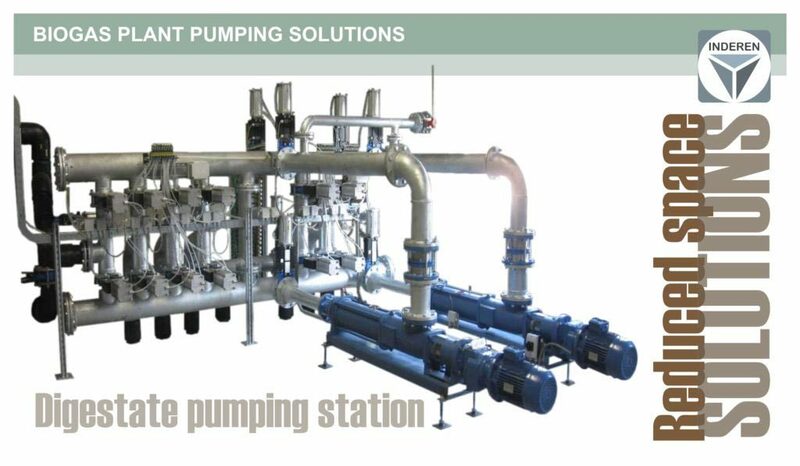 We also produce solutions in marine containers, such as custom manufacturing of pumping stations, electrical and control panels in biogas plants, heating boilers and exchange. 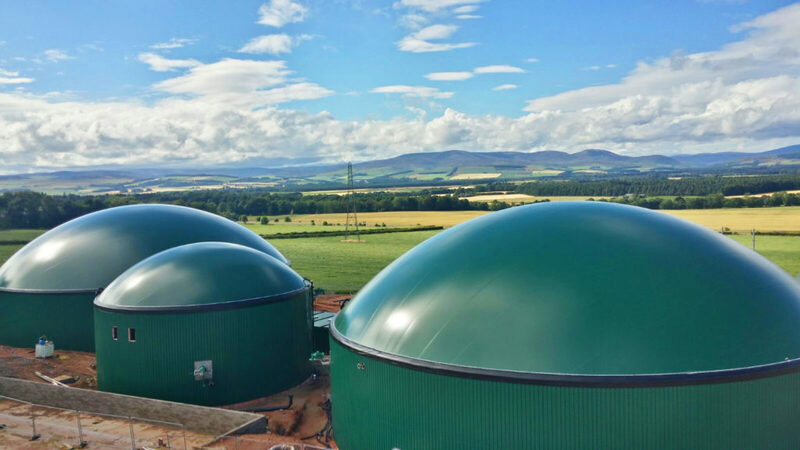 Learn more about what we do in the Biogas facilities. 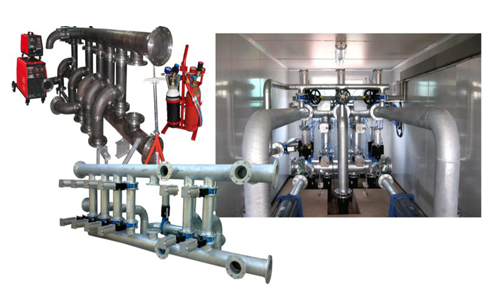 STAINLESS STEEL, GALVANIZED STEEL, HDPE, PEx, PPr, PUC, etc. We are fully certified for all these types of welds. 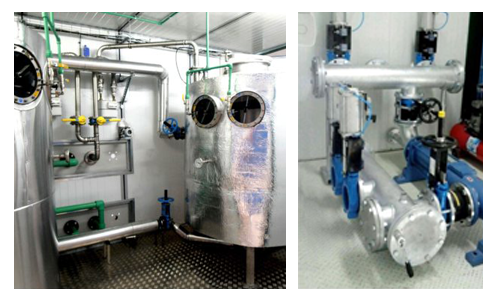 It is necessary the conduction outdoors of the different types of elements, the picture on the right is an example of a pipeline for pre-treatment of methane biogas to cogeneration. Our manufacturing capacity of pipelines in our workshop, allows us to develop customized solutions for any type of industrial installation. GAS lines, hot water, glycol, HDPE sludge, PVC PRESSURE, heating, steam, compressed air. 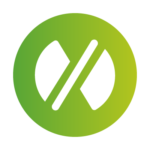 By integrating the design, manufacturing and assembly within the same company, Inderen optimizes the resources and shorten the duration of the works. Broad experience in assembly and installation of electrical and pneumatic automatisms, valving, pumping, blowers, connections, gutters. 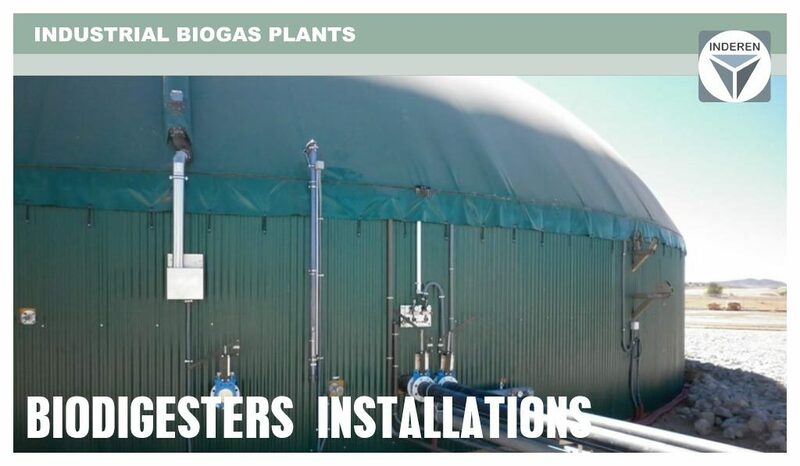 Integral installation of components in biodigestors, agitators, pipes, control sensors, internal heating systems, etc. 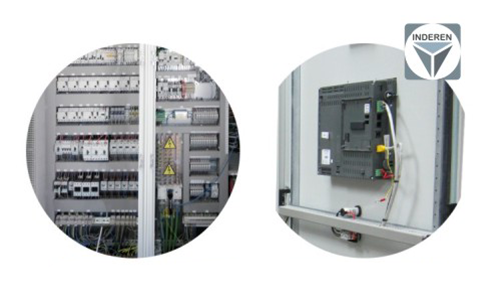 We are used to manufacturing electrical and control panels with PLC in SCADA system. 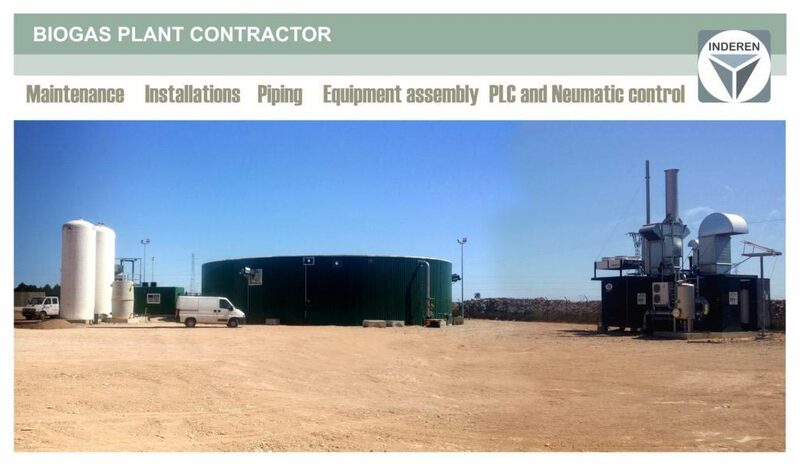 Our technicians for installation and maintenance of components and automatisms, are qualified to carry out the installation and commissioning of the industrial installation of the biogas plant. Please do not hesitate to trust us and to ask for further information.